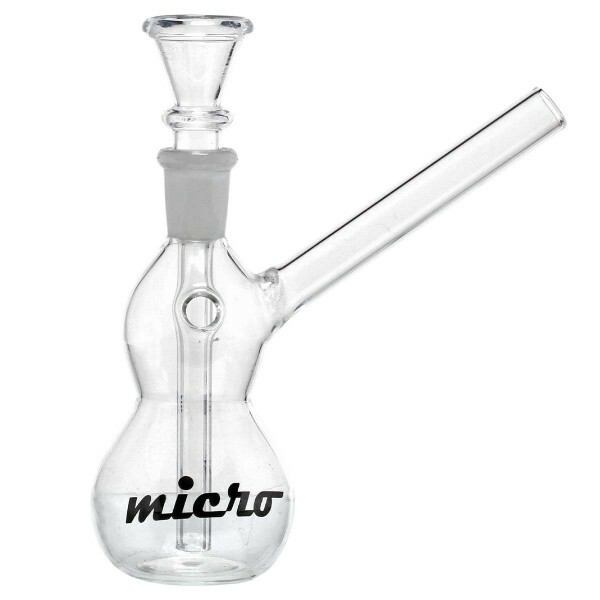 This Micro Glass Bong is a simple piece of glass art that will give you a nice hit! It is formed in the shape of a bubbly bottle tube of 14cm height. It comes with a detachable socket of 14.5mm diameter, used as a diffuser, in order for your smoke to spread into the tube and get filtered by the water. The socket connects to a slide bowl for placing your tobacco or herb. Your bong includes also a kick hole at the height of the socket that will offer you the option of enjoying a different toke angle. With the Micro logo featuring at the bottom of the tube, the bong ends up in a sidecar mouthpiece ring. For prices, please sign in. Subscribe to the free newsletter and ensure that you will no longer miss any of our Shopoffers or news.